As part of my treatment for depression I attend groups based on CBT. They always make me take a look at myself but it varies what I take on board at the time. I've just started another group and I have noticed that each time a group begins I feel I need to make a change. One of the things I love about your hair is that it can be changed so very easy and can make a massive difference on the outside, which can only be a good thing on the inside. It did the trick, I loved it! The change on the outside was the catalyst for change on the inside. I had instant new found confidence. A few hours in the salon, was like flicking a switch to a new Mrs Brown. Yes, this is me! 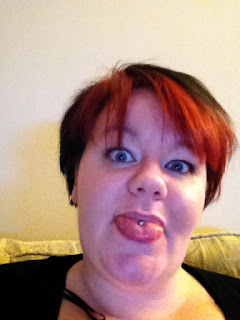 My hair not looking great and I seem to have crazy eyes as I was so impressed with my flicks but gives you an idea, cringe! Since then really jus been maintaining the dark and red and growing down the sides with the thought of going back to my inverted bob (my fail safe hair do!) but .......... I've just started a new group and guess what the googling hair pictures has started again!! So I'm thinking a dark red all over, like burgundy or mahogany and thinking bout a chop again. I really love Frankie Sandford's style - very similar to what I did the last time but thinking of not getting the right side shaped in as much. So what does starting a group go to do with my hair? Your hair is part of your identity and many people go to the salon when they want to change something in their life. Where else can you be completely transformed in a few hours? My hairdresser can't fit me in till next Friday so I have a whole week to decide who I want to be and what I want to change. This time, now that I am aware these hair changes are linked to my group attendance I am going to make a conscious effort to ensure my hair change isn't a replacement for the changes I want to make on the inside. Your hair can be a quick fix but true confidence comes from more than your hair. What does your hair say about you? Do you fancy a change? p.s. I am not a hair dresser or sponsored by any colorants, just a girl who likes to shake things up in the hair department.